el paso daily photo blog by chacal la chaise: To the Students: What Is and Why the Need for Superb Owl Sunday? 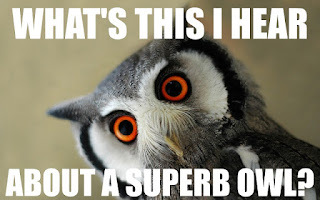 To the Students: What Is and Why the Need for Superb Owl Sunday? What Is and Why the Need for Superb Owl Sunday? Hearkening to information that covers copyright infringement and fair use in general and specifically for commercial use, many announcers for companies not sponsoring the "big" event went out of their way not to refer to Sunday's championship game by its official name directly. As a results, they carefully, even haltingly and irony removed the words "Super Bowl" or "Super Bowl Sunday" from their scripts. This is because of the exorbitant amounts "official" sponsorship companies pay for advertising during the game and pregame shows. That's roughly $175,000 per second (Huddleston, 2019). But things being ironic and fun, suddenly, misreading or re-emphasizing an alternative spacing of letters produced Suberb Owl instead of the other two words. Of course, this let loose with all sorts of Hedwig cousins flying around the internet as so many puppy bowl howlers. Huddleston, T., Jr. (2019, January 30). This is how much it costs to air a commercial during the 2019 Super Bowl. Jauron, V. (2019, February 3). A snowy owl rests on Jones Beach on Long Island in New York [Photograph]. TheAtlPhoto. (2019, February 3). Superb Owl Sunday III - 28 photos of these magnificent nocturnal hunters.